This ragu recipe was taught to us during a private cooking class in one of our favorite restaurants in Montepulciano –our favorite town in Tuscany. I’ve made it several times since our lesson with Angela. It has come out perfectly each time. Because it’s just Jeff and I at home, this recipe makes enough for us to freeze and use later. We use it up pretty quickly (within 3 weeks). After letting the sauce cool, I ladle enough for one meal into a freezer ziplock bag and label it with the date so I can keep track. Maybe it’s best not to tell Angela I’m freezing the sauce . . . 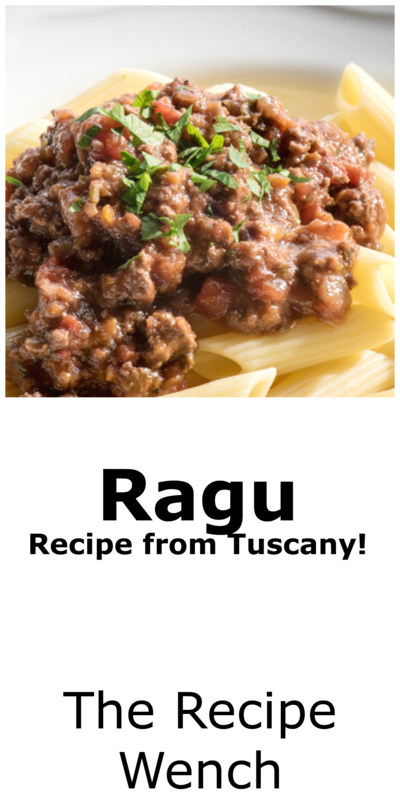 But between us, I’m letting you know I feel pretty smart and on top of things as I prance on over to our freezer and take out a bag of this sauce when we’re in the mood for a taste of Tuscany! I’m patting myself on the back and you will be too! We will never tire of Tuscany. Winter, spring, summer, fall — it truly is Heaven on Earth! Thanks to Pamela Haack of Strada Toscana, Angela of Fattoria Pulcino, and Airbnb, we had a super enjoyable stay and cooking lesson in Montepulciano several months ago (time flies!). A mere four-hour drive from our home, any destination in Tuscany is one of our favorite Italian road trips. On this particular trip Jeff and I took our daughter Alyssa and her husband Zach with us as well as our dog Heidi and, judging from the way we looked by the end of the drive, ALL of Heidi’s fur! We stayed in a very comfortable and cozy apartment, which we found through Airbnb. The apartment was within walking distance to the town center and it had a large yard for Heidi to explore. With all the travelling we’ve done over the years, I find that more often than not I’d rather stay in an apartment than a hotel. I like having access to a kitchen, a living room and, believe it or not, I don’t miss the daily maid service. The highlight of this trip was the private cooking class Strada Toscana helped us arrange. The class was given by the very talented Angela of Fattoria Pulcino. Back in 2009 we did a class with Angela, and it was amazing. Needless to say, we were very excited to be able to see Angela again! Fattoria Pulcino is located in a building which was formerly a monastery and is run by the Ercolano Family — Sergio and Gabriella, their 6 children, 18 grandchildren and a host of other relatives. The love for what they do is immediately apparent when you enter Fattoria Pulcino. We arrived at the restaurant bright and early and were greeted by a very energetic Gabriella who served us cappuccini. Angela got us all set up with aprons and chef’s hats (no doubt, to help us feel like we knew what we were doing!). The class couldn’t have been more informative. We made ragu and a spicy chili sauce. We also made pici pasta (a homemade pasta typical of that area), tortellini, tagliatelle and several “crostata,” which are fruit-filled desserts along the lines of a cookie/pie combination. We watched as Angela’s sister, Stella, prepared “Pollo al Mattone” at the gigantic wood-fired grill. Take a whole, butterflied chicken, lay it out over very hot coals and plop two bricks on top while cooking. It’s just so simple and so good! Stella offered us bruschetta and a refreshing glass of white wine while the chicken was cooking. After our class we sat down for lunch and enjoyed everything we made that day and more, including a gorgeous Bistecca alla Fiorentina perfectly prepared by one of Stella’s sons. If you’re planning a trip to Italy, visit Strada Toscana to see what tours they have planned. Pamela and her husband, Lou, live in Umbria, Italy and offer boutique-style small group tours and workshops. Great to hear! I would love to hear how it turns out for you. And we always have plenty of grated parmesan to go along with with our pasta! WOW! This is something I am dreaming of doing one day! A cooking class in Italy...amazing! I can't wait to get into my kitchen and try this out! Thank you for sharing what you learned! Oh you're welcome! It was a fantastic experience. I hope you get to do this some day! Yay, a new recipe to add to my Master Menu :) I like to freeze my meals in portions (use giant muffin pan for that)! And then when I don't feel like cooking the kids can pick out whatever there want out of the freezer! They love it! You're a smart cookie! Enjoy the sauce!